In the spirit of challenging ourselves a little more every day (see last week’s post) it’s time for this week’s Boot Camp Challenge. 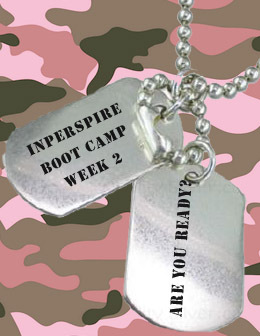 Boot Camp begins Friday and ends Sunday at midnight. Let us know you’re in (up) for the challenge and on Monday’s post let us know whether you were able to complete this week’s challenge. At the end of this week’s challenge you will have the satisfaction that comes with challenging yourself AND you can grab a badge for your blog/website/personal calendar. You will also be added to our Boot Camp Roll Call (I will have last week’s Roll Call completed by Sunday). *Wall squats: The challenge is to do 10 sets of 20 count wall squats. If you cannot hold a wall squat for 20 counts, modify the count and do 10 sets of that count. If you are unsure what a wall squat looks like, see image below. If you are unable to maintain a 90 degree squat, modify as needed. This is all about you so do what you can. **Planks: The challenge is to 10 sets of 10 count planks. If you can hold planks longer please adjust your count, if you cannot hold a plank for 10 counts, please adjust. If you are unsure what a plank looks like, see this quick one minute video. The Boot Camp Challenge is meant to challenge you at whatever level you are now. You can split the challenge anyway you like, e.g., you can do 50 jumping jacks on Friday, 50 on Saturday, and 100 on Sunday. If you cannot do a full sit up, modify and do 25 crunches in the morning, 50 crunches in the evening, and so forth. Tags: 24 Hour Fitness, challenge, challenge yourself a little more every day, hooah. Bookmark the permalink. I’m in. I glad you put this together. I’ve got such a busy weekend. I doubt I can fit a bike ride or run in. But I can squeeze these in. Not sure about the push ups. Always been a weekness. But that’s what a challenge is for. Since, I heard about this via a repost I’d like to put it up in my blog. Hi Megan! Glad you’re in. Yeah, about the pushups, they’re hard. Always my weakspot. Last week I eeked out 100 (modified pushups) and this weekend I am going to split them up – 50 on Saturday and 50 on Sunday! I would love for you to repost on your blog – the more the merrier. Have fun! Count me in again! Oh, and you did make the deadline for the drawing – so keep checking back. Winners 4-6 will be announced today. Glad you’re in again and glad I made the deadline. I will be checking frequently (by the way, I love your “unique” drawing system). Have a great weekend! I was relaxing with my cup of tea, and now this, who comes up with this stuff. I am in, HOOAH. I’m in (I think). I thought you were going to GRADUALLY increase the challenge! Jeesh! Sounds like a good one to take on with the holiday weekend! Looking forward to it! I do think I got a bit carried away with it last night, but then I thought, it will definitely challenge us 🙂 Have fun and enjoy the long weekend. I’m in again. This time I will not procrastinate! I know…I am going to start today. I learned my lesson last time! Coach D had to show me how to post. Just goes to show that lots of years of education can still leave a lot of gaps! So, I did the last challenge, and I’ve been doing 200 situps a day since. including this morning at 6 am . I’m pretty proud of myself, and my teenager jeans are fitting better! I saw Carolyn in her jeans today and let me tell you are looking “marvelous!”. I love it when my pants (in my case shorts and skirts because that’s all I wear) fit well. It just makes my world so much better. You have already done your 200 sit ups!!!!!! Hooray! We certainly are a crazy bunch to enjoy a boot camp challenge so much – I love it. I will definitely incorporate some of this but just not all of it. I think it is great though for people wanting to push themselves past their own mental blocks that tell them they can’t when we can do more than our mind says we can!!! Count me in! This is just what I need to add strength training to my routine. Yikes! I’ll be doing this on Sunday after the race. Well, I’ll try to do this on Sunday after the race. The squats and planks have me worried. I love the Yikes! 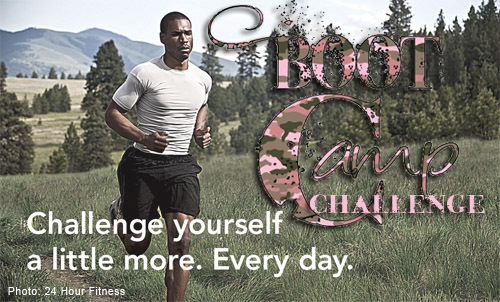 Racing and boot camp is going to be a real challenge – don’t wear yourself out – you have two little ones and lots of racing goals – but – if you do it – hooah! Oops! Ran 5 miles tonight with the little guy. It was just what I needed to get my confidence up. Today I gave up on my manual push mower, I think that it would work great if you have a nice smooth yard with no rocks or sticks, I do not have that. I bought an electric mower, and it worked great, so for exercise today I cut the grass, and when Darla came home from work we walked 3.6 miles, that was very good for us. The people that know me know that I love to exercise and stay active, but late on Fridays, not so much, but it was fun. Now it is time to get on with the Friday. Yay for no more manual push mower. Now our grass is going to look like it’s cut! Not really, Jimmy, well, kind of… Anyhoooo, I have a big summer program that planning and it meant that I couldn’t work out this morning, as planned, so I did the next best thing for me and that was to go walking (in the heat) after work. It was nice, but hot, and I was glad we walked. At the end I did 50 of the 200 jumping jacks and 25 squats. Then we took the cats out in the backyard and let them run around and enjoyed the outside for a while. Now, a nice glass of wine, some Dave Matthews, and Friday evening. i saw last week’s challenge on thursday and decided that since it was so late in the week i’d just be a week behind. i remembered last night(sunday) at 11:30 about the challenge BUT i finished the first weekend’s challenge with five minutes to spare. i’m excited for next weekend! thanks for doing this!